The word Ombré is French for shading or graduating. Hair stylists have coined this terminology to describe a color technique used in salons. Ombré hair can range from a subtle and natural effect to really dramatic and edgy. For a natural “end-of-the-summer” look, color should blend from dark to light with no harsh transition line. Ombré hair is great for many reasons: it’s highly economical, incredibly low maintenance, and works with any texture or tone. Almost always, bleach is the key ingredient to create the ombré effect. This is the reason one should go to a professional. Find a stylist that specializes-in or has created this look before. Ask your stylist for lots of beachy highlights concentrated on the ends, no higher than your chin in most places. Frame your face with a few subtle pieces that are only a shade or two lighter than your natural color and then go as light as you want on the ends. To maintain the look, use a color-safe shampoo and a moisturizing conditioner. Light ends can dry out, so use a nourishing protective oil from your chin down. Try these: Enjoy Haircare. ‣ Choose the color you want your ends to be – not the color of your hair. 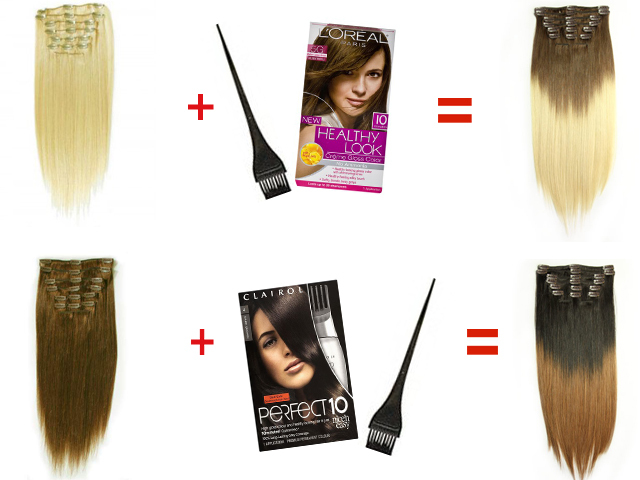 When coloring hair extensions – always dye dark, never light (bleach). ‣ Choose an at-home box color that matches your roots. ‣ Dye the tops of the extensions to blend with your hair. Posted on May 8, 2012, in Beauty, Features, Hair, How To and tagged at home, beachy highlights, Best clip-in hair extensions, bleach, blend with hair, box color, celebrity hair trend, chin, Clip-In Hair Extensions, color technique, color-safe shampoo, concentrated, dark to light, DIY Ombre Hair, dramatic, dry hair, dying hair extensions, economical, edgy, effortless, end of summer look, ends, Enjoy Haircare, Enjoy Oil, Enjoy Sulfate-Free Shampoo, frame face, French, get the ombre look, graduating, how to, low maintenance, Milani Hair Extensions, moisturizing conditioner, natural, no harsh line, nourishing protective oil, Ombre Hair, Ombre Hair trend, pieces, professional, roots, salons, shading, stylist, subtle, terminology, Texture, tone. Bookmark the permalink. Leave a comment.